'Put it away!' Public begs MPs. In the aftermath of the Panama Papers, or 'Ashely Madison for the Moneyed', there has been three days of national celebrations of the Prime Minister's discomfiture. However, the public is now increasingly weary of senior politicians waving their tax returns about. Offenders seem to be those who are self-identifying as 'important' and senior MPs who have already given their personal finances a hasty spritz of intimate deodorant. Parliamentary Standards officials have been scrutinising the revelations. 'So far we have dismal displays of humble-bragging about how small one's tax return is, while others seem prone to reckless exaggeration,' stated spokesman Quentin Phelps. 'When I heard about the size of Boris Johnson's' tax return I simply had to pleasure myself, ' admitted Susan Greaves, a phleobotimist from Gosport. 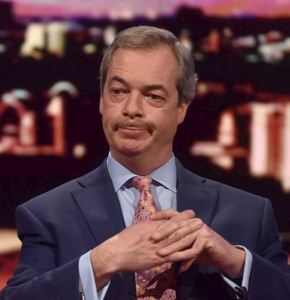 Nigel Farage has been attracting grudging sympathy and derision in equal measure for not wanting to show his, amid speculation that it is 'tiny and ludicrous' and 'amusingly bent'. Note for Ed: image I cropped from one originally credited to Reuters. In the aftermath of the Panama Papers, or 'Ashley Madison for the Moneyed', there has been three days of national celebrations of the Prime Minister's discomfiture. However, it is becoming apparent that the public is growing weary of politicians waving their tax returns about. Offenders seem to be those who are self-identifying as 'important' and senior MPs who have already given their personal finances a hasty spritz of intimate deodorant. Too late to correct the typo: "Phlebotomist"
Yep - that was a typo and I never even noticed, despite double-checking (the spelling in my head that I had typed). Old age.